Wells Collection of Brooklyn, N.Y., is recalling 8-oz. 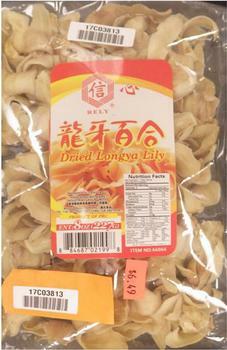 packages of Rely brand Dried Longya Lily containing sulfites which are not declared on the label. The consumption of 10 mg of sulfites per serving has been reported to elicit severe reactions in some asthmatics. Anaphylactic shock could occur in certain sulfite sensitive individuals upon ingesting 10 milligrams or more of sulfites. Analysis of the recalled product revealed it contains 92.9 milligrams per serving. The recalled product, which comes in an 8-oz., clear plastic package marked with ITEM NO: 66066 on the label and UPC code 8-8468702199-8, was sold by retail supermarkets in New York and Texas. Consumers with questions may contact the company at 718-381-2388.